Review why it is important to have a non-FBA warehouse to fulfill Jet.com orders. Using your FBA warehouse to fulfill Jet.com orders is not explicitly prohibited by Jet. However, using FBA for fulfillment to Jet customers is not effective because Jet determines the winning seller based on factors including proximity to the customer - this information cannot be communicated to Jet for product in Amazon's fulfillment center network. It is also important to maintain strong seller metrics and meet Jet's fulfillment terms. This includes the time it takes to ship an order after it is acknowledged. On occasion, sellers experience delays fulfilling multi-channel orders using their FBA warehouse. This can be due to seasonality affects, weather conditions, or an unexpected increase in volume at the FBA warehouse. For these reasons, it is strongly encouraged that you have a non-FBA warehouse set up to fulfill Jet.com orders. You can certainly use your FBA inventory as a backup using Zentail's Warehouse priority settings! Jet Fulfillment Nodes are unique identifiers for a specific fulfillment center. 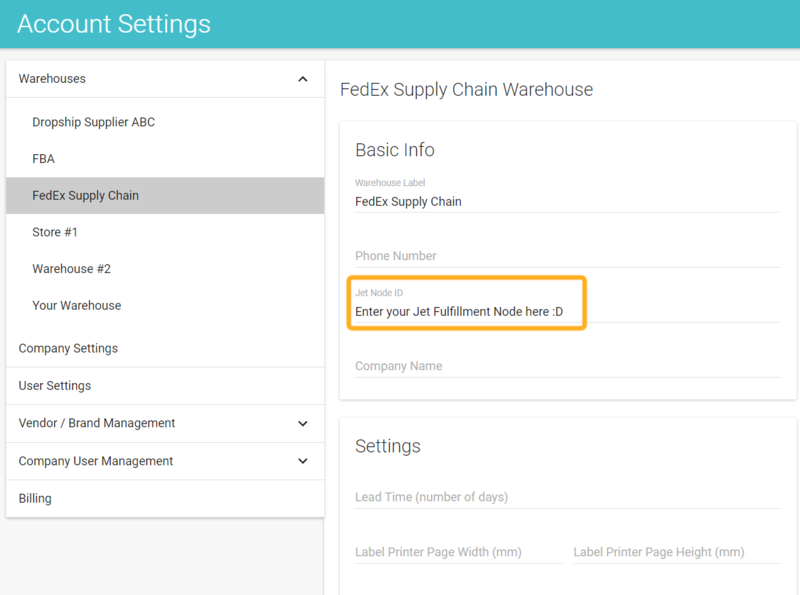 All of your warehouses in Zentail (Account Settings page) must have an accompanying Jet Fulfillment Node created in your Jet Partner Portal. If you haven't done so already, create Fulfillment Node for each warehouse by clicking on the purple New Fulfillment Node button in your Jet Partner Portal and following the onscreen prompts. Log into your Jet Partner Portal and visit the Fulfillment Settings page. Log into Zentail and visit the Account Settings page. Enter the Jet Fulfillment Node ID for the corresponding warehouse into the Jet Node ID field in Zentail and save your changes. What is the Jet Rules Engine and how do I optimize my Jet.com sales?